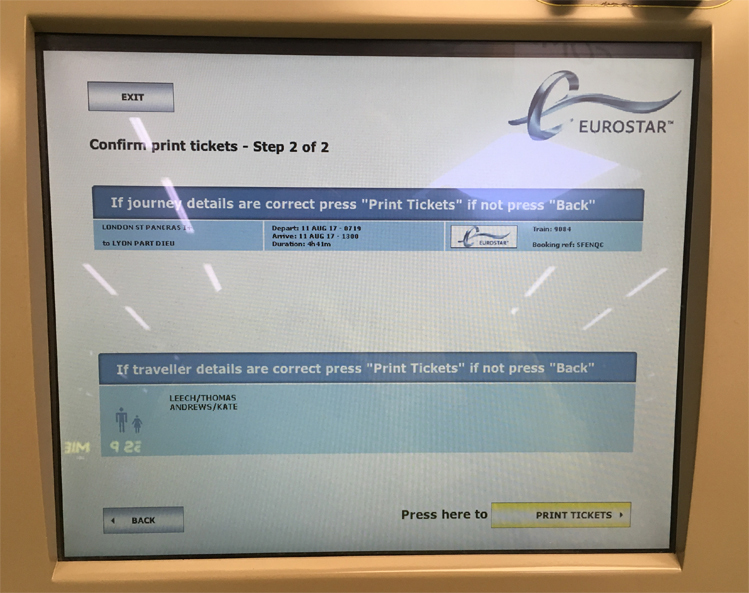 This article contains step-by-step instructions for collecting Eurostar train tickets from self-service ticket machines at the station. For information about ticket types and their availability, see also our Help article Ticket delivery options. France: Paris Gare du Nord, Lille Europe and Calais Frethun. Tickets can be collected from any Eurostar machine and at any time before your scheduled departure. Tickets are normally available to print a few minutes after your online booking is complete. The following details are required to collect Eurostar tickets: Collection reference (“PNR”). You will not need your payment card. We no longer offer collect-at-station tickets for combined Eurostar/TGV tickets (called "French Connection" fares) from SNCF-only stations in France. We will issue print-at-home tickets for these journeys. Collect-at-station tickets are only offered from Eurostar terminals (London St. Pancras, Paris Nord etc). 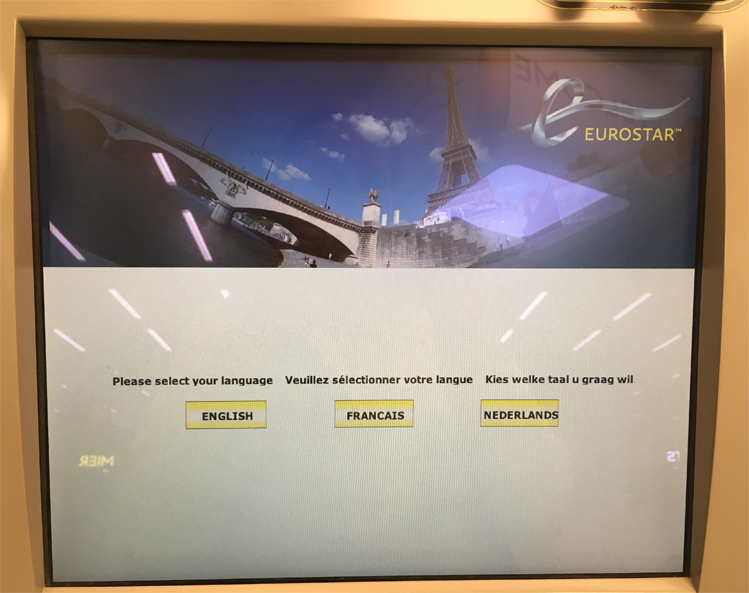 Using the touch screen, select your language. Eurostar tickets booked on Loco2 do not require you to enter a credit or debit card number. Simply use the touchscreen to enter your six-character code, and press "OK" to proceed to the next screen. Your collection reference, sometimes called a "PNR", is a six-character code that you'll find in your booking confirmation email. It is different from your Loco2 order reference (Loco2 order number are eight characters beginning with “LO-"). Your booking reference may include several journeys or passengers. 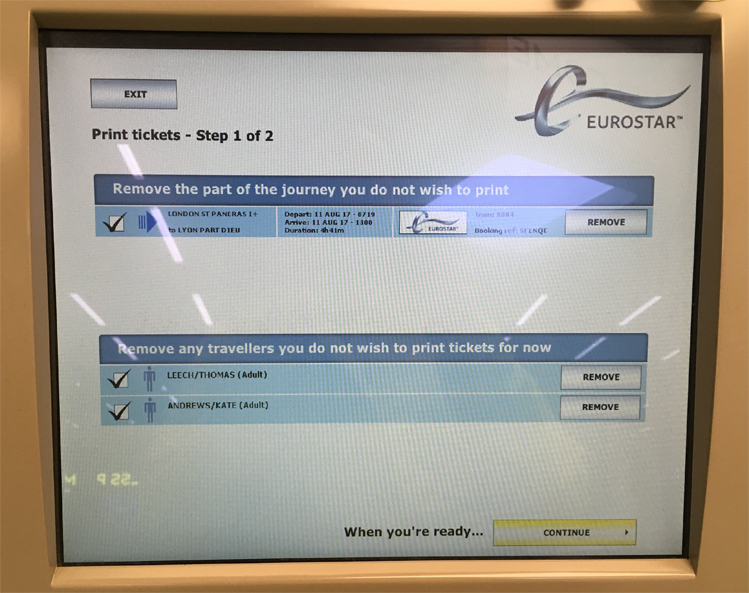 If you only want to collect tickets for one leg of a return trip or individual passengers, you can remove any tickets you don't want to print at this stage. If you want to collect all the tickets, just press "continue". Check all of the journey details carefully before pressing “Print tickets”. 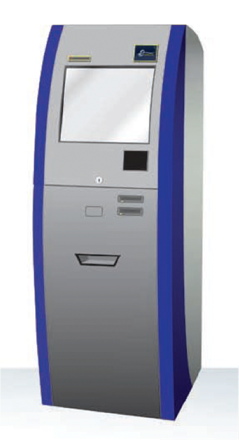 Your tickets will dispense from a slot beneath the screen. Make sure that all of the tickets have printed before leaving the machine. 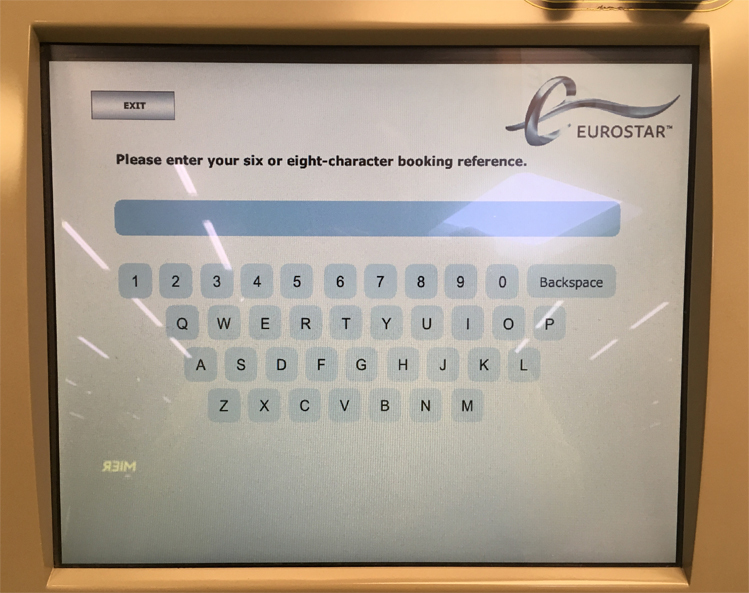 Go to Eurostar's site to manage your booking, and enter your PNR and surname. Click "Submit". Click "Enter details and get your tickets", where you'll be directed to a page to enter passenger details. Enter your email address and phone number. You can use the same one for each passenger. Download your print-at-home tickets and print them when you are ready.